S H O U T O U T S ! ! ! 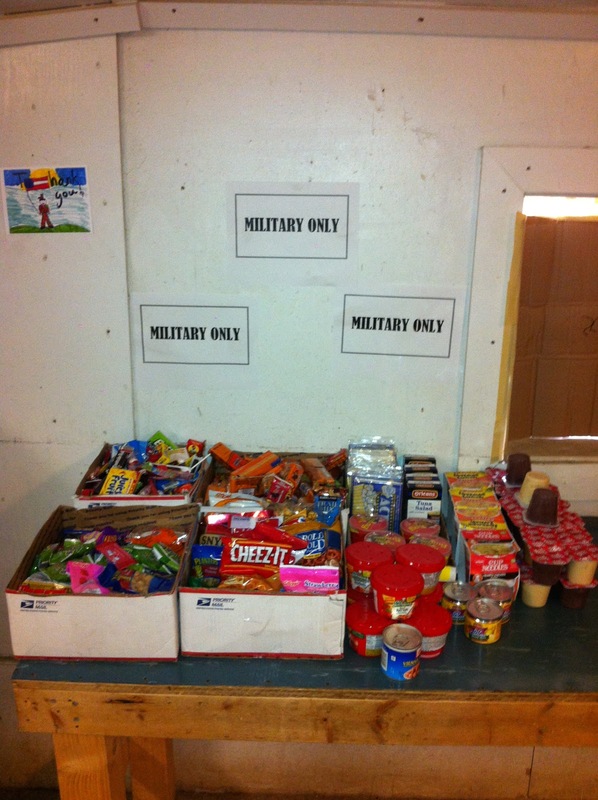 The contents of many Care Packages laid out in our mini mess hall - gone in two days! I know it has been a while since I posted an entry and for all those who have been waiting with "bated breath and whispering humbleness" (Google it) for an update, I apologize for the extended hiatus. One of the main purposes of this blog is to be an open letter to my family (i.e. my Mom) to keep them posted (pun intended) on how I am doing while deployed. 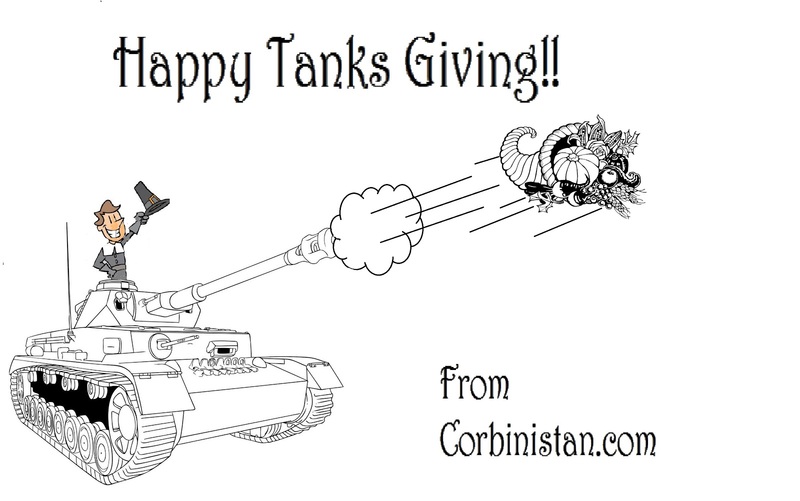 And since my Mom posted on FaceBook she hasn't seen anything lately on Corbinistan.com, I thought I better get to it. You see, I have always felt an accompanying picture/graphic was important to highlight an entry and for the past little bit it has been not so picturesque; quite dreary with overcast skies, cold rain with corresponding mud - nothing really worth writing home about. But those at home, who send letters, cards and Care Packages, have not been remiss in supporting deployed Soldiers and I thought it appropriate to dedicate an entry highlighting those individuals. @ Helen C. and the great Virgin Angels in SF, CA: Dola, Doreen, Andrew, Joe, Nina, Grace, Tiera, Ashley, Rob, Andre, Dustin and Kristin (I hope I got you all). Your letters are greatly appreciated and the snacks you send I tend to keep mostly to myself but I shared the great DVDs - our USO is going to have a "Mad Men" marathon thanks to you all. I just got a letter today from Damian; best wishes for a Merry Miami Holiday! @ Logan G. of London (very close to Corbin! ), KY: Thank you for your letter; you have good hand writing for an 11 year old. I am not married and do not have any children but I do get to spend some time with children on Sundays at the Cat in the Hat Language Arts Center here at Bagram; there are kids about your age who are learning English. Unfortunately, I do not know how to play Xbox 360 so when I get bored I tend to read a book on my Kindle. The type of gun I have is called an M-249; I understand you are very curious about whether I have been shot at or if I have shot someone - it seems that is a common question from guys your age (and all ages) - but it isn't something most Soldiers like to talk about. I can promise you it is nothing like TV or the movies. It is getting cold here; yucky and muddy but sometimes we get some clear skies with the sun glistening on the surrounding mountains for a beautiful view. The Afghanistan money is called Afghanis with one US Dollar equaling about 50 Afghanis; I will see about mailing you some real Afghanis. @ Soldiers' Angel Lori W. of Katy, TX: Tell your 76 year old Dad his card did make me smile. I haven't seen the Gangnam Style dance yet but I am sure it is good exercise and hope your lupus does not keep you from practicing. Thank you for your efforts in writing to deployed Soldiers. @ Operation Buckeye and Susan, Kathleen H., Maria S., David, Mary and Daniel J., Robin and Dan S., and Stephen G.: The Care Packages you sent were great; the picture above is where I sorted the snacks into different boxes in our mini-mess hall where a couple hundred Soldiers eat lunch each day - everything was gone in less than two days! @ Soldiers' Angel Leslie S. of Mill Hall, PA: Thank you for being a troop-supporter since 2006! It is great you take time from being a full-time college student and Mom to write to Soldiers; as a member of a large military family I know you know how much it means to Soldiers to receive mail. @ American Legion Auxiliary, San Anselmo Unit 179 of San Anselmo, CA: Thank you Jan, Edna, Debra, Lauren, Ellen and Girl Scouts of Northern California (Troops 32053 and 30729) for the fantastic Holiday Stockings (and very nice home-made snowy holiday cards)! My favorites were the almonds and beef jerky but the shaving gel was greatly appreciated as our PX here in Bagram ran out some time ago. Also, the hand/feet warmers were just on time, too; with the weather getting pretty chilly in the evenings, the Soldiers on gate guard duty were very grateful. @ Estes Family of League City, TX: The home-made cross necklaces were given to Soldiers who were happy to wear them and the Christmas decorations were used to decorate the "Rats Nest" a small Morale Welfare and Recreation building where Soldiers go to shoot pool, play ping-pong and relax. Thank you very much for sending so much holiday cheer. @ Karen D. of Simi Valley, CA: Thank you and the kids for the great drawings; if you look at the picture above, you can just make out one of the drawings where they are decorating the walls of our mini mess hall. The books were taken to the Cat in the Hat and the snacks were quickly gobbled-up. @ Desert Angels of Auburn Hills, MI: The gate guards greatly appreciated the snacks and candy from your packages while the books, magazines and socks went to the USO where they were snatched up by Soldiers from all over Bagram. Thank you very much for your continuing support. @ Anne W. of Cedar Rapids, IA: Thank you for the Snoopy Letter; we heard all about Hurricane Sandy and hope everything is back to normal. Our unit did not do much particularly special for Halloween but there were some ghost and goblin decorations as well as candy shared with everyone. @ Si (Sonny) Tenenberg (former Marine - ongoing supporter of Troops) of www.troopcarepacks.org and Janet, Silvana, Kathy, and Alyssa of First Baptist Church of San Luis Obispo: The green socks were a big hit and a pair went to several grateful Soldiers. The candy and snacks went into the boxes in the picture above and were enjoyed by hungry Soldiers who were very happy to get something special with their Army chow (well, maybe some of the beef jerky and Slim Jims got stuck with me). @ Soldiers' Angels Valerie and Chaplain Bill K. of Bronx, NY! : Thank you for the nice card as well as your thoughts and prayers. @ Soldiers' Angel Patti McD. of Ravenna, OH: You are right about the weather changing here; from hot and dusty to cold, rainy and muddy; not many trees changing colors but Soldiers are changing into beige fleece jackets. My Dad was a Navy guy like your husband but all of his sons went into the Army. Thank you for writing to deployed Soldiers and sharing your thoughts. @ Soldiers' Angel Melissa M. of Las Cruces, NM: One of my brothers was born in Las Cruces but it seems we only lived there long enough for him to come into the world and for me to get tubes in my ears. Thank you for the "Forget me Not" flower and for clearly caring so much about Soldiers. @ Julie B. of Salem, MA: Your Care Package with Pringles, PB crackers, Swedish Fish and candy was a big hit with all the Soldiers I shared the goodies although I kept the oatmeal for myself - I get teased by some of my coworkers because I use hot coffee to make the oatmeal but it sure gets me going in the morning! I also enjoy running, and like you, have done a marathon but once is enough. I am a big fan of the movies and one of the things I miss most is going to Friday/weekend matinees of opening films; it's a bummer to miss "Lincoln", "Hobbit", etc. Thank you and your friends and family for supporting deployed Soldiers. @ Operation Gratitude of Encino, CA: Thank you to everyone in your organization for the great support of deployed Soldiers. The Care Packages you sent were distributed to Soldiers working at our warehouse where they have 24-hour operations. The snacks and goodies were a great treat and greatly appreciated. @ Karen M. of Belmont, MA: Thank you for the healthy nuts and dried fruit - I kept those for myself while giving the "donations" from Sir Peter and Butterfly Kate's Halloween baskets to co-workers. I am not much of country music guy, but I like the title "Two Days in November." @ Sharon G. of Woburn, MA: Please tell Julie her efforts in coordinating the TLC Packages are greatly appreciated. I enjoyed the pictures of your furry "children" - particularly Shelby's cool sunglasses. We do have a Green Beans Coffee shop here on Bagram but I am not familiar with the Cup of Joe for a Joe program - although I am all for coffee! My co workers sweeten theirs with sugar and cream but I take mine black. Thank you for your support, thoughts and prayers. @ Soldiers' Angel Gale R. of Cherryville, NC: Thank you for your nice card - when I saw it I thought the pottery was some sort of Mesopotamian artifact but it turned out to be traditional Armenian. Your support, well-wishes and kind words are greatly appreciated. @ Danielle, Cora and Daniel H. of Portland, OR: The jerky and almonds stayed with me but the Pringles, M&Ms and Pringles went to Soldiers on gate guard duty; thank you very much for the great Care Package and nice Christmas card - it took me a while to figure out the "25" on Santa's train was for the 25th of December. @ Pat and Mac McCoy of Yellow Ribbon Support Group in Palatine, IL: Your generous Care Packages contributed to the boxes in the picture above as well as to Soldiers on gate guard duty. I took the stuffed animals to the little girls at the Cat in the Hat where they brought bright smiles. Thank you very much to your great support to deployed Soldiers. @ Holli G B. of Owensboro, KY(! ): Thank you for the yummy snacks; I usually keep Slim Jim type of things for myself but shared them along with the other items. We have made good use of the Chess game and play almost every day; your support of Soldiers, as well as The Humane Society, is greatly appreciated. @ Soldiers' Angels Dave and Daisy J. of Canal Winchester, OH: Thank you for taking time away from babysitting David and Sarah to send the nice card and letter; I hope Dave's cane has a slip-proof tip to handle your ice and snow. @ Operation Shoebox of Belleview, FL: The great variety of snacks was distributed to numerous Soldiers and the toiletry items went to the USO where they were grabbed up by needful Soldiers; thank you very much for your ongoing support of deployed troops. @ Katrina M. of Las Vegas, NV: There is a certain Sergeant First Class whose favorite treat is peanut M&Ms so she was very happy to get the ones you sent. The soups and granola bars were shared amongst Soldier's in my unit; thank you for your generosity. @ St Hugo Second Grade Brownie Troops 70874 and 70883 as well as Desert Angels of Bloomfield Hills, MI: It was very nice to see the picture of all the smiling Brownies but the best part of the great packages you sent was the great hand-drawn Christmas card with the decorated tree and Brownie waving hello under the American Flag; I taped the card to my wall where it brings me a smile every day. All the great goodies went to our mini mess hall and were enjoyed by hungry Soldiers. @ Joyce M. K. and Hibernia United Methodist Church of Coatesville, PA: Nothing says Christmas like a colorful stocking stuffed with goodies! I am sure your son shared with you what is like for us here at Bagram and your are 100% right it means very much to Soldiers to know that folks back home are thinking of us; the prayers well wishes definitely help keep our spirits up and make the days a bit brighter. Thank you very much for your concern and care. @ The Military Support Group of Rhinelander, WI: The snacks, treats, and movies you sent were shared amongst the troops and were greatly appreciated. Thank you very much for your care and efforts; I know as Veterans you understand how important mail call can be and much expressed appreciation means to a Soldier. @ Kelli C. of Seobu-Myeon, South Korea(! ): It was very nice and quite a surprise to receive your package from Korea! I was in Seoul many years ago and your note had me thinking about some yummy yakimandu and bimbimbop. The strawberry Oreos are still on my desk because the package makes me laugh. I hope you enjoy your adventure in Korea and thank you for the nice letter. @ Gilda and Tom M. and Maureen Corbin(!!) C. of The Dataw Island Community in St Helena, SC: Thank you for the great package; I will take the gliders to the Cat in the Hat for the boys - we just had a field trip to the air strip where they got to go inside a C-130 so it will be fun for them to put together and fly the gliders. @ Maureen - there are not too many Corbin's around so we must be kin somehow! @ Amanda C. Morrow J. of Amherst, NH: I wanted to be a complete Scrooge and keep the bag of homemade holiday cookies you sent all for myself but I have shared them with co-workers to enjoy with our morning coffee. Thank you also for the decorations; we used them to bring cheer to a new Sergeant's work area. @ Anyone I missed and did not address specifically: Thank you very much for your support of deployed Soldiers; people here like to tease me about the mail I receive but Soldiers like the ones who spend long hours on guard duty in the cold and/or dark are extremely grateful. Soldiers can be rough and gruff but they really are very appreciative of the thought, care and efforts made by those who show support with letters, cards and packages. Best wishes to all for safe and enjoyable holidays! As I mentioned, back in 1986, when I was a young Private First Class stationed in Heidelberg, Germany, the US was still in the Cold War with the USSR and the Arms Race was in full throttle with everyone stockpiling atomic, nuclear and other weapons. To shield us from Nuclear, Biological and Chemical (NBC) threats, every Soldier was issued a protective mask (gas mask) and special clothing - which back then was called MOPP gear (Mission-Oriented Protective Posture). You may have seen pictures or videos from Desert Storm of Soldiers wearing gasmasks with black Mickey Mouse gloves and funny looking bulky clothing that made them look they were wearing a Hollywood special effects fat suit - that's MOPP gear. MOPP gear has different levels from "Ready" to Level 4 depending on the threat - from: have your stuff ready; to: big mushroom cloud on the horizon. As you might imagine, wearing MOPP gear is not something Soldiers looked forward to but in the Army you need to ensure you know how to wear and use your equipment - train how you fight. One of the things every Soldier still does during Basic Training is go through a gas chamber filled with tear gas (chlorobenzylidene-malononitrile, if you want to get technical ). The main purposes being to ensure you know how to put your mask on correctly as well as giving you an appreciation of how the equipment protects you; secondary purposes are to give you a taste of what it is like to be gassed and for the great amusement of Drill Sergeants. First, you go in with your gas mask on, then, your Drill Sergeant, who keeps his mask on, has you take yours off. It has been 29 years since I went through the gas chamber and I still remember like it was yesterday. Today, NBC has evolved to Chemical, Biological, Radiological, and Nuclear (CBRN - pronounced see-burn); the Soldiers who become trained specialists in this area are 74Ds. He told me he enjoyed the esprit de corp of the Marines but likes the opportunities the Army offers; when he was in the Marines his job was much more combat-oriented than what he probably will experience as a CBRN Specialist. As you might imagine, there is not, (thank goodness! ), a great daily demand for CBRN services, so the 74Ds tend to have additional duties and provide support in other areas. Our Orderly Room, our unit, and the Army, in my opinion, is fortunate SPC Hutchinson is with us and no longer a Marine - ever since I first met him about a year ago, he has always impressed me as being a can-do Soldier with a positive attitude and great military bearing: Marines 0; Army 1. S H O U T O U T S ! 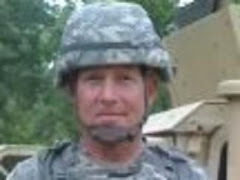 @ www.operationbuckeye.org and PVT Jacob L. of Columbus, OH: Thank you for the Care Package; the toiletries went to our Orderly Room so all the Soldiers in our unit will have access and the treats were shared amongst our Soldiers. @ Sharon S. of Westlake, OH: I enjoyed your letter and story about Perch-flavored ice cream in Russia; thank you for your ongoing support. @ www.operationbuckeye.org and David, Mary, and Daniel J. of Columbus, OH: I smiled when I saw Daniel's signature on the card; thank you for the treats - I gave them to Soldiers on Guard Duty. @ Kay H. of Huntington, Beach CA: Your starfish postcard brought a bit of the beach to the desert; thank you for writing. @ www.operationbuckeye.org and Jack and Nicole S. of New Albany, OH: Thank you for the great Care Package - the Pringles in your Care Package were greatly appreciated by my fellow Soldiers and I really like the "energy" gum. @ Helen C. and the Virgin Angels: Thank you for your letters and the eclectic Care Packages - I really enjoy the colorful stationary and, must admit, I am kinda selfish about your packages and keep most of the items for myself. I look forward to meeting you all in person next June-ish. In 1986, I was 20 years old and serving with USAEUR 7th Army in Heidelberg, Germany. Ronald Regan was President and while his main geo-political focus was the Cold War with the USSR, things got hot with Operation El Dorado Canyon when the US bombed Tripoli in response to Libyan agents' terrorist bombing of the La Belle disco in West Berlin, Germany - killing three people and injuring around 230 people, including 79 American servicemen. country under a provisional military government. Around this time, a young 10 year old Haitian boy by the name of Emmanuel Bien-Aime, decided he wanted to someday be a Soldier so he could do good and help others. In 2010, Bien-Aime, then living in Massachusetts, fulfilled his childhood aspirations by becoming a Soldier in the US Army. Today, Specialist Bien-Aime is here in Bagram, serving on his first deployment while his wife and three children wait back in MA for his safe return. SPC Bien-Aime has always given me the impression of being a good Soldier, but this month, he proved to be the very best Soldier in the 96th Aviation Support Battalion (ASB) when he outperformed at least 17 of his nominated peers to win the November Soldier of the Month Board. A Soldier of the Month (SOM) Board does not really have a civilian equivalent, but think of it as an extremely intense job interview conducted by a panel of leaders who are doing their best to be very challenging and intimidating. Suffice to say, SPC Bien-Aime was judged on his military appearance and bearing while being grilled by 96th ASB First Sergeants on topics such as Army Regulations, Military Programs, world affairs, and the history of the Battalion as well as the 101 Combat Aviation Brigade. As the winner of the November 96th ASB SOM Board, SPC Bien-Aime distinguished himself above his peers and showed his potential as a future leader. In the picture above, SPC Bien-Aime is showing a MP3 player donated in a Care Package by Veteran and former Army leader, Sergeant First Class (Retired) Terry Brillheart of Austin, Texas. SFC Brillheart has generously sent me Care Packages with school items for the Cat in the Hat Language Arts Center, treats and goodies I distribute to Soldiers, and items such as eReaders and MP3 players, which I give to very deserving Soldiers in recognition of their winning the 96th ASB monthly SOM Board. SPC Bien-Aime told me he recognizes SFC Brillheart's as someone who "has been there" and appreciates his ongoing support of the military. In this month of Veterans' Day, I echo SPC Bien-Aime's appreciation and offer my sincere gratitude for those who support deployed Soldiers with Care Packages, letters and cards - thank you for continuously keeping us in your hearts and minds, and not just in November. @ Kara and Phil T. of Houston, TX for the Big Easy post cards, the beef jerky (which I kept for myself), the granola bars and treats that I shared with my co-workers. @ Linda M of Tishomingo, OK for being a Soldier's Angel and sending mini PayDay bars (one of my favorites! ), instant oatmeal for healthy breakfasts and maybe not so healthy chocolate puddings - I took to the gate guards who will be up all night in the cold. @ Lois L. of Streetsboro, OH for the Care Package of snacks and treats which I shared with the Soldiers who work at the supply warehouse. @ Jesse D and the Solera Residential Community in Beaumont, CA for the great box of apple sauce, crackers, nuts and writing materials; almost everything was distributed amongst very appreciative Soldiers - I kept the apple sauce for me. Last week I was talking to a 20-something Soldier who works in our Orderly Room (kinda like the Human Resources department) and when he asked how things were going, I quipped, "Just another Happy Groundhog Day." And he responded, "Oh, today is Groundhog Day? I didn't know." "Noooo," I drawled, "I was talking about the movie; did you ever see that Bill Murray movie - 'Groundhog Day'?" "Uh, I think I remember it," he answered. SGT Corbin sees these as teaching moments to pass on military history and tradition but sometimes thinks others might see them as SGT Corbin being a weird/know-it-all old guy. Anyway, it got me thinking about how in the early/mid-90s "Groundhog Day" entered the popular lexicon as verbal short-hand for monotonous repetition and was often used by military personnel but now seems to have lost some of its usage when the concept is really more appropriate than ever for deployed Soldiers. This is, by the way, is in no way an original or unique observation of mine, but just something I have been dwelling upon the last week or so. In the movie, Bill Murray finds himself waking-up each morning only for it to still be the ‘same day’ - Groundhog Day; no matter what he does, or what happens, every day is a repeat. For deployed Soldiers, it is a very similar experience with the days blending together - maybe being somewhat distinguishable by what was served at the Mess Hall (Thursday is Pizza Day, Friday is Steak Night, etc.) or perhaps Wednesday standing out for the Ground Maintenance Meeting. But even those 'landmark' events become fuzzy with week-after-week repetition. At first, it seems to make time go by faster and it seems like the deployment will be over and we will be back home lickety-split. In the movie, Bill initially uses his infinite do-over days to figure out how to rob banks, play practical jokes and indulge his various appetites. But, eventually, the predictability and sameness without apparent end weighs heavily on Bill and he begins to devise various ways of short-circuiting the day by dropping a toaster in his bathtub or driving off a cliff. For deployed Soldiers, once they are in an every-evening rut of 'Call of Duty' or simply being overwrought with the time left in the deployment and being separated from family, it can be a challenge to self-motivate and stay positive. This period of time can really be tough on everyone - Soldiers and family - so it is very important to stay focused on the mission, to keep in touch with family and loved ones, to use the time in constructive ways for personal growth instead of the stagnation of spending all free time playing video games or watching TV. Bill eventually broke free of his self-destruction cycle through the desire to have a relationship with love-interest Andie McDowell and used his déjà vu days to learn classical piano, to speak French and some pretty nifty ice-sculpturing skills. He also learned about the people around him and how even the smallest thoughtful and considerate actions could have a great impact on others. So, if you are deployed, or know someone who is deployed, push yourself/your Soldier to positively combat the every-day ennui by strengthening relationships and doing things like volunteering at the USO or Cat in the Hat, taking on-line college or military courses, writing/practicing rhymes, working-out, or getting involved in unit activities. 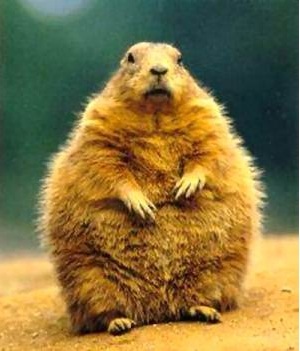 That way, we can be like Bill and get past Groundhog Day, stronger and better, to the next day. @ Helen C.& amp; the Virgin Angels - I really enjoyed reading about your KISS-adventures; all the letters are spirit-lifters. Maybe next June I will be able to visit SF for some pampering and sushi. @ Heidi& amp; Scott L. of Sidney, Iowa - Thank you for your note and the Comics; we get some via the Sunday Stars & Stripes but it is always good to get more laughs. @ Desert Angels of Auburn Hills, MI - As per the note in your generous Care Package I "opened and shared"; the "love, hope & prayers" was and is greatly appreciated. @ Tom Y. of Poolesville, MD - The candy and treats went to Soldiers on Gate Guard, the books went to the USO library and the socks went to a Soldier next to me who really needed clean ones - pee-you (teasing). @ Yellow Ribbon Support Group & Pat and Mac M. of Palatine, IL - Thank you for the boxes of great treats and toiletries as well as the 'teddy bears' - the treats were immediately distributed to a number of Soldiers, the toiletries went to a distro area so they can be used as needed, and the teddy bears will definitely go to Afghan girls at Cat in the Hat. @ Bobby S. of Hudson, Ohio - When I was in high school I was focused on girls and Frisbee, not sending Care Packages to Soldiers; thank you for the beef jerky and gum - I kept the jerky for myself and my 'neighbors' are happily chewing.Good luck to Hudson High making the playoffs. @ Pat G. of Pride Packages - I salute your Marine Veteran son and your on-going support of deployed service members; the candy, crackers and cookies were enjoyed by Soldiers in platoon and unit. the potable (poh-tah-bull) meaning "drinkable". Here in Bagram, and just about anywhere else in Afghanistan, Soldiers are strictly forbidden to drink alcohol and while the local water may be potent, it's certainly not potable. All our potable water comes in half-liter plastic bottles which are ubiquitous (look it up) here as the rocks and dust. While individual bottles are available in every mess hall, also outside of almost every living quarters, work place, and various random spots, you will find a bus stop like structure housing a six-foot high stack of grab-and-go plastic-wrapped 12-packs - depending on the location, sometimes the stack is just plunked down in the open air. As the palletized stacks get consumed, about every two-weeks or so, a truck (civilian contractor) comes by with a new load. 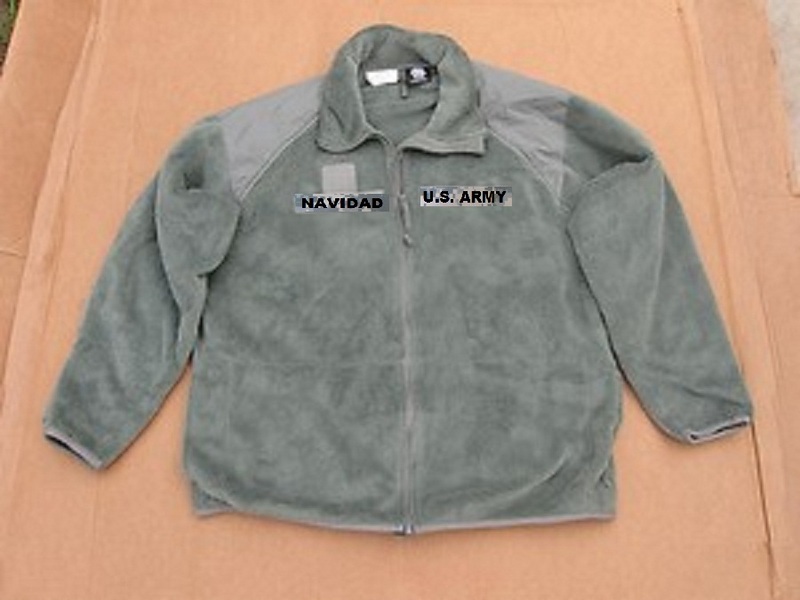 So there is plenty of potable drinking water; although the plain Jane flavor can get boring which is why many Soldiers' Care Package wish lists include those little sleeves of flavored drink mixes for their bottled water. But what about water for bathing, brushing and shaving? Well, like just about every other consumable item that makes life possible here, if not wholly bearable, it is trucked in on a fairly regular basis by, you guessed it, a civilian contractor, and stored on site. Sometimes the storage container is a ginormous heavy-plastic bag that looks like Godzilla's own old fashioned hot water bottle but where we live there are up-right water tanks. If you look closely at the picture above of our water tanks, you should be able to read "Disinfected Non Potable Water"; which means heavily chemically treated to kill bacteria - depending on how "fresh" the water is, it can smell like you are taking a shower in rotten eggs. When we (sulphur) shower, wash our hands, flush the toilets (thank goodness we have 'indoor' toilets!) the water comes from those tanks - so, on the rare occasion, when those tanks go empty, so does the wash basin taps, etc., until the "Non Potable" truck comes and does a refill. What goes empty much more often and seems to take even longer to refill, is the much smaller tanks within the shower areas where the water is heated for our sinks and showers. With a whole bunch of Soldiers shaving and showering each morning, if you do not get yours at the right time, you can end up doing the chilly willy dance. Just like back home where you have people who seem to feel parking space lines are just suggestions and selfishly straddle, we do have a small minority of Soldiers who feel it is okay to full steam ahead on their showers. Most Soldiers, however, do what my ex-Navy Dad called a "Destroyer" shower: Get in; get wet; turn off the water; get soapy; turn the water on; get rinsed; turn the water off and; get out. Personally, I do my best to be quick about my shower and use minimal amount of hot water when shaving. But, I'll tell you, man, oh man, I can't wait to get back to the States and be a real water hog. @ www.operationshoebox.com - Mary H. and volunteers - The eight home-made treat bags were very nice and were distributed to Soldiers within my work area and were immediately opened and enjoyed; thank you for the gifts and your ongoing support of deployed Soldiers. @ Angela Wood of Fort Campbell - You are the greatest! The Met-Rx bars and almonds will be my lunch for weeks but the fantastic school supplies could make a life-time difference to the kids at Cat in the Hat - I will be taking the items this Sunday. You really are a wonderful person. @ SFC Terry Brillhart, US Army (Retired) and Friends - Thank you very much for the thoughtful cards/notes; I hand-delivered a couple to Soldiers on Gate Guard but had enough that every Soldier in one of our Battalion's smaller company units was able to get a letter/card. The school supplies are wonderful and I will take them to CITH this Sunday. The MP3 players are very generous - my plan is to give one to the winners of our Battalion's Soldier of the Month Board for November and December - if the winner is amenable, I will post their pic and bio. @ Helen C and the Virgin Angels: Damian, Dustin, Kristin, Andrew, Nina L., Joe and Ashley (hope I got everyone) - Thank you for the punny H'ween card and super Care Package; even if I had no idea who had sent it, just by the contents I would have known it was from SF. I mean, Miso Soup?!? I joke, but I went all Gollum-it's-mine-precious on the soup and gave everything else away (okay, I kept the Edamame, too). The mini-packs of M&Ms, almonds/nuts and Swedish Fish and caramels went into a box of other items I took to be distributed to Soldiers who do not get much mail. @ Carl Corbin - My brother and Army Veteran; thank you for taking the time to get a package out - the Dr Seuss stickers are pretty cool and will definitely bring some smiles. @ All above: I promise a written letter as well - Thank you very much for your care; it is truly appreciated! I don't like it, no way. Hungry as hell, by noon. Said, Mess Sgt, Mess Sgt, feed me please. If you want to be One-oh-one, you gotta be thin. The above running cadence says "Mess Sgt" because that's where Soldiers went to eat chow: at the mess hall. At least, they did when I first learned the cadence in Basic Training at Fort Lost-in-the-Woods, Misery (that would be Fort Leonard Wood, MO to you non-Army types) back in June of 1983. But when I came back into the Army in '09, when we were talking about the chow, I kept hearing people refer to the "Dee Fack". I was truly puzzled until I asked someone and they explained that the DFAC was the Dining Facility - somehow, in the short 19-odd years I was out of the Army, ‘mess hall’ changed to ‘DFAC’. I've been back in the Army for almost four years now and I still haven't made the adjustment; I still refer to the mess hall and do a mini-mental adjustment whenever I hear someone say DFAC - just one of the many things that sets me apart as an "old school" Soldier. Here in Bagram, and in most of Afghanistan, the people who cook/serve the food and keep the mess hall clean are not Soldiers at all, but civilians. Typically locals, eg Afghans, hired by whatever company the Army has contracted to provide food services. There are several mess halls scattered throughout Bagram and each meal is served for several hours - they almost all also offer midnight chow (everyone still calls meals "chow" so why DFAC?!?) so there is plenty of chances to eat. The issue, sometimes, can be the time to eat. Where me and many of my unit's Soldiers work is just far enough from the closest mess hall that at lunch time it would take at least an hour to walk, wait in line, eat, and walk back. Even though we are working an average of 10-12 hour days (I can just hear some of the Soldiers here saying "you just work 10 hours?!?") taking well over an hour out the work schedule to get chow is just not acceptable and could negatively impact the mission. So, since Mohammad can't get to the mountain (in a timely manner), our leadership has arranged to bring the mountain to Mohammad - in the form of Mermites. Not termites, not vegemites, but Mermites - large insulated aluminum canisters with a rubber gasket between the lid and base; basically, military grade Tupperware. meat offered), macaroni and cheese, and corn. They might also grab a box or two of mixed fruits such as pygmy pears, Granny Smiths and oranges. But they always bring back loads of various types of pies, cakes and cookies. The Soldiers bring the chow back to a rectangular wooden building that was commandeered and set-up with acquired dining tables and chairs along with an electric cooler for drinks. They set-up the Mermites, lay out the desserts, ensure the cooler is fully stocked, and open the door to the Soldiers who have already lined up; hands-washed and ready to eat. After a couple of hours, the mess hall closes, gets cleaned, and the mostly empty Mermites get loaded up and get returned to the civilian mess hall. And the Soldiers who did all the hauling, serving and cleaning? Once the mess hall work is done, they go back to their real jobs; such as 94R Avionic and Survivability Equipment Repairer or 15D Aircraft Powertrain Repairer. The mess hall tasking gets rotated so the same Soldiers have it just about every day for a couple of weeks and then some different Soldiers take over for a couple of weeks. But I have noticed a couple things stay pretty regular and consistent - the service is always with a smile and a maybe a joke; the drinks' cooler is constantly restocked; desserts are sliced and laid-out just as quickly as they are put on plates and; the Soldiers obviously take pride in doing a good job ensuring their buddies are well fed. So, while they may not be cooks by trade or training, in my opinion, those Soldiers are all Top Chefs. @ Charity S. of hockey fame – Your emails bring me a smile but the chocolate got a huge “yahoo!”; the combo of treats was perfect and not melted at all. I kept the beef jerky for myself but everything else got distributed to people in my work area and a big box went to the Medics and their “customers”. I read the magazines in one sitting and gave them to other hungry readers. @ Vivian and the rest of Ms Soto’s Big Spring’s Elementary 3rd Grade Class – glad to hear you liked my letter and I look forward to receiving your art work. @ Kim W. of Cheney, KS – a certain 1SG loves popcorn and workers in my area now have PopTarts for breakfast. Thank you for the sparkly black-cat and looking into supporting CITH – it is truly a good cause. @ 10 y/o Madeline of Knolls Afterschool Club in Simi Valley, CA – thank you for the Halloween Greetings - scary blue-skull pirate! @ www.ForTheTroops.org and volunteer Catherine M. – the people who deliver the mail had me come to them for the giant three boxes; every person in my Platoon got a box and there was two left over I gave to Soldier’s in my Company; they all extend their sincere gratitude for the Care Package and your ongoing support.